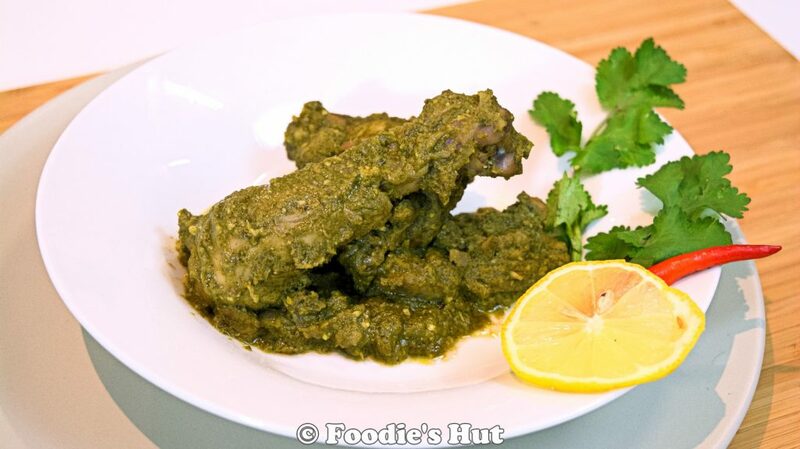 Dhone pata Murgi or Bengali Chicken Curry with Coriander is a mild curry dish. It has lots of flavours from spices and the freshness of Coriander leaves. This dish is a great weeknight wonder with either steamed Basmati rice or Roti /Naan and some Salads. Feel free to use boneless chicken pieces if you want. In that case, leftover could be a beautiful filling for Pita bread. Alternatively, you can use this chicken dish in Tortilla wraps for lunch box. In a blending jar, add cilantro or coriander leaves, green chillies, add a little bit of water and blitz to make a smooth paste. Transfer the paste into a bowl. Into the same jar add pistachios and blitz for few times to make a paste. In a mixing bowl or a ziplock bag add half of cilantro mixture, ginger and garlic paste, lime juice, chicken pieces and mix everything well, set into the refrigerator for at least two hours. Then bring to room temperature before cooking. In a high-sided skillet or Dutch oven heat oil, add tempering and stir for few seconds to release extract and flavour for spices. Add sliced onion, salt and sugar, over medium heat cook for 7-8 minutes or until onions are cooked through and develop a pinkish colour. Add marinated chicken, coriander powder (if you wish you can add it in marinating too) salt and cook over high heat for 3-4 minutes to release the moisture from the mixture. Reduce the temperature to medium-low, cover with a lid and let it cook about 15-20 minutes or until chicken almost cooked through. Stir in between 2-3 times so that the mixture does not stick to the inner bottom of the pan. Add pistachio paste, the rest of cilantro mixture, Garam masala powder, give a good stir to mix everything well. Add a little bit of water. Over high heat cook for few minutes, about 4-5 minutes, when oil is releasing from the mixture, turn off the heat and cover with lid. Serve with steamed rice or any flat bread.